Geolocation is defined as the process of physically locating or the actual location of an object on Earth. In defining contextually aware networks, it is no longer enough to know whether someone is on-net or off-net. Where they are "off network" is important as well and can offer additional insights and opportunities for engagement. Geolocation primarily leverages a Smartphone's built in Global Positioning System (GPS) and uses the installed application and either Wi-Fi or cellular backhaul to report current location for users that have opted in to this offering. This enables the operator of a contextually aware application to engage with the customer outside the "four walls" of the organization. At this macro scale, location is typically measured in meters however results vary wildly depending on the type of location being deployed. Assisted GPS uses a secondary system to increase the accuracy of the GPS satellite reporting. In the case of Smartphones the cellular network is responsible for assisting. This enables the phone to download information about the GPS satellites in order to quickly determine its position and provide updates at an interval frequent enough to be useful for engagement purposes. The newest smartphones are able to use both the US Department of Defense GPS system and the Russian GLONASS system to further increase accuracy. These solutions are limited in scope from an engagement perspective as they require clear visibility to the sky, so they tend to not function in large downtown areas. Recent testing has shown that A-GPS offers approximately an 8 meter accuracy range, which is typically accurate enough for any of the geolocation use cases. IT is important to note that accuracy in dense urban centers may still be challenged at times. One of the most important aspects of constructing a contextually aware network is the concept of geofencing. A geofence is a virtual construct that overlays a logical "fence" on the world map and allows decisions to be made as a device crosses the geofence or is inside or outside that geofence. A virtually unlimited number of geofences can be constructed, but it is important to know when engaging with the customer is meaningful and wanted. Since the geofence is virtual, no equipment is required at any location defined by a geofence. Let's assume for a moment that you are headed out on a gambling vacation to "The Vegas Hotel" on the south end of the Las Vegas strip and have installed their mobile concierge app. Upon landing at McCarran airport and taking your phone out of airplane mode, it is able to recognize its GPS coordinates via A-GPS and the concierge app wakes up. Once awake, the app prompts you to meet your hotel shuttle outside baggage claim #2. 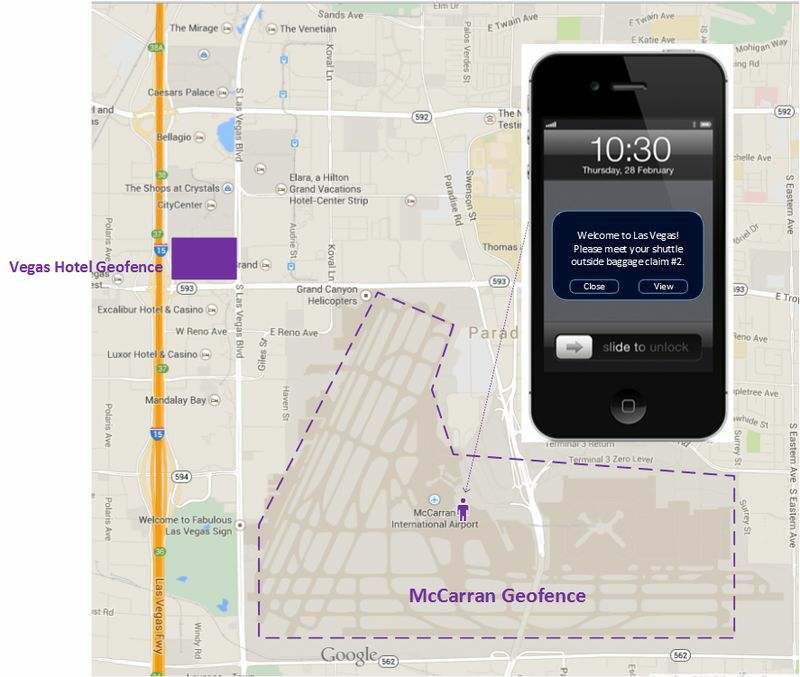 Once you meet your shuttle and arrive at the hotel, you could also cross a geofence. This hotel side geofence lets the hotel know that you have arrived on their property. A property geofence allows for analytics around when customers are on or off property, insights into the shuttle service travel times, etc. Geoconquesting is the ability to leverage geolocation and fencing to pursue those who are patronizing a competitor's location. This information may be used for direct customer engagement via their installed application or indirectly by providing information that can tailor how future marketing is done to sway the customer's future decisions as to where they spend their money and/or time. Let's assume that the "Vegas Hotel" highlighted above is running a strategic marketing campaign to capture more business on the south end of the strip. Geofences could be established around competitors properties for analytics purposes to help an organization better understand how much time their customers are spending on property versus at a competing site. Typically this can then be used to entice users to come back to their establishment. Geofencing is a very powerful component of context aware networking, however the engagements need to be used sparingly as there are many users who feel this type of engagement could be an invasion of privacy if they weren't expecting to receive messages. There are many use cases for the back end analytics enabled by geofencing from location enabled work flow automation for a mobile fleet to targeted interactions with customers to predicting whether or a patient might arrive for a doctors appointment or not and early adopters of this technology have a distinct competitive advantage versus those who do not have the same capabilities.